Alberta’s challenges are national challenges. It’s a message nobody can ignore as the first ministers meeting gets underway in Montreal. Bilingual print ad in the Journal Métro de Montréal. The Government of Alberta has taken the unprecedented step of buying advertising in three newspapers, buying significant space on three websites and using the sides of buildings to remind people and premiers that denying access to tidewater costs Canada’s economy $80 million a day. The ads will start on Thursday and run over the weekend in French and English. 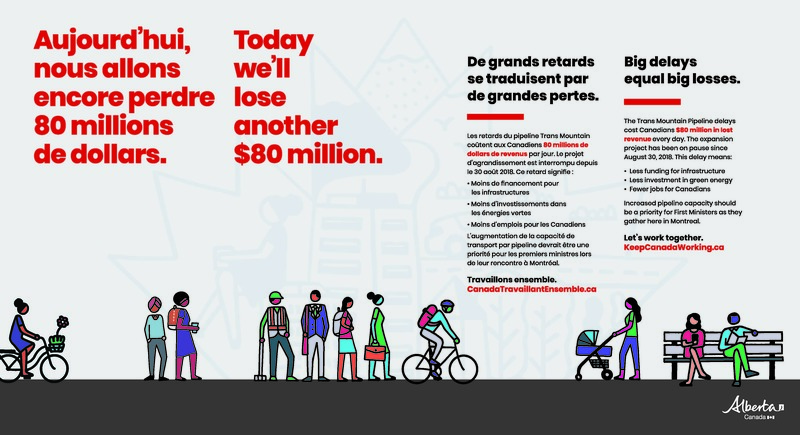 The Government of Alberta has been letting Canadians know the benefits of the Trans Mountain Pipeline expansion in national advertising for several months. In Ottawa, Alberta has put up a counter that tracks the damage done to the Canadian economy since work on the pipeline was halted in August. It will hit $8 billion on Saturday.